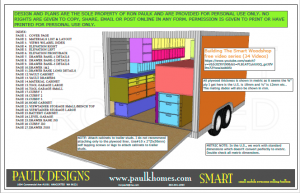 The SMART Woodshop plans are designed for an 8x12 trailer but can be scaled to fit any size trailer, box truck, van or stationary shop. After 30 years of real-world contracting and lots of trial and error, the SMART Woodshop brings it all together into the best design yet! The plans are extremely detailed and include jig designs, materials & cut list, to help with building your SMART Woodshop. The plans are delivered in a downloadable PDF format. The link is found on the bottom of your receipt that you will receive immediately after placing your order.